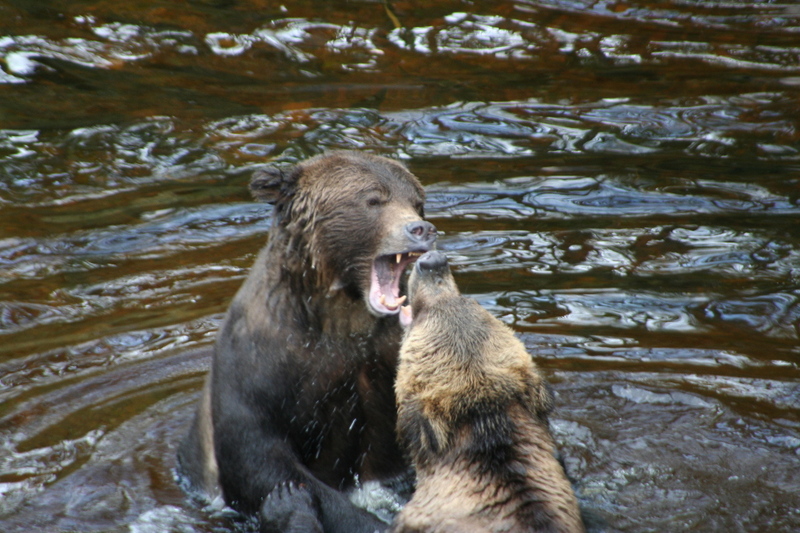 Our grizzly bear viewing area in British Columbia’s Knight Inlet is home to more than fifty bears. The abundance of salmon in our tours’ area reduces the need for bears to fight for the best fishing place. 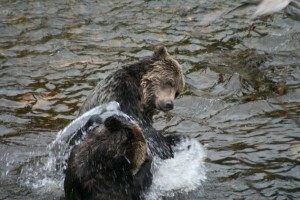 In fact the grizzly bears, big or small, seem to coexist with out much conflict. So it is hard to tell if this is serious or just playing. I was not present when the photo was taken. 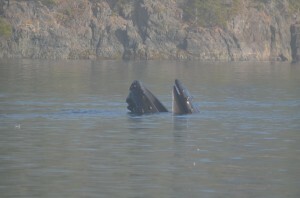 Humpback Whale after lunge feeding? It is hard to determine what happened in this photo which shows a humpback whale slowly sliding backward into the water as I was not present when the photo was taken. Lunge feeding occurs when a whale comes up suddenly under a school of herring and comes out of the water with its mouth wide open engulfing the herring and spraying water everywhere. Not mush spraying here. Not enough splash to be the remainder of a breach. My guess would be a young humpback after a less than successful lunge or maybe one that has been watching to many orca spyhopping? 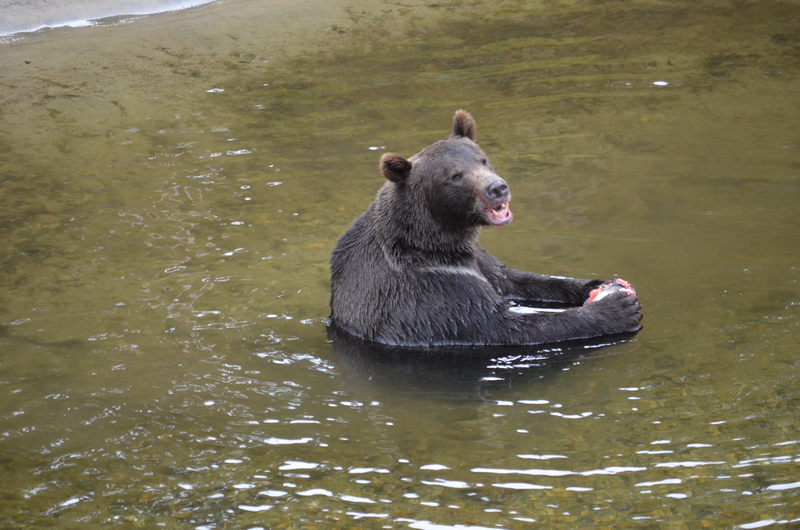 Once the grizzly bears we view on Knight Inlet’s Glendale River have caught their salmon they eat but where is the question? This on has decided that sitting in shallow water and using four feet is a good idea others prefer to find a rock to use as a table. 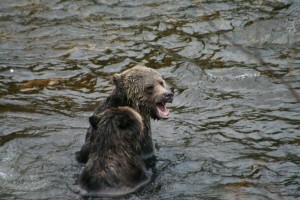 Some retreat to the shore for fear of the salmon escaping and a few move into the surrounding bush. 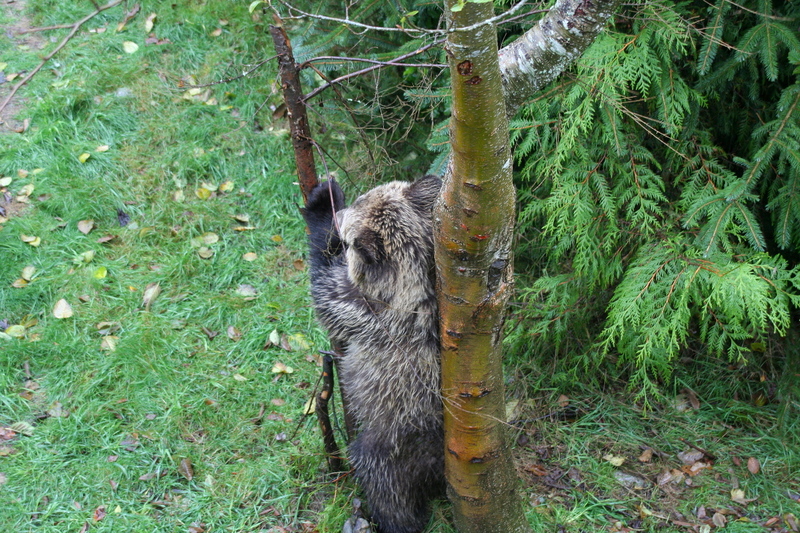 When the bears are done with the carcasses they break down and feed the plant life of the forest. 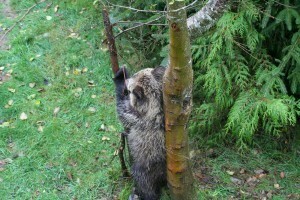 The trees in the forest close to the rivers have been found to carry salmon DNA. This only makes sense the trees are going to use whatever is available to grow and what could be better than healthy salmon carcasses? 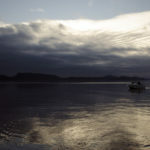 From this scientists have been able to take core samples from these trees to determine what years have had good salmon runs thereby creating a record for rivers and determining the historic levels of salmon is various coastal rivers of BC. Yes that is one of the viewing stands in the background. 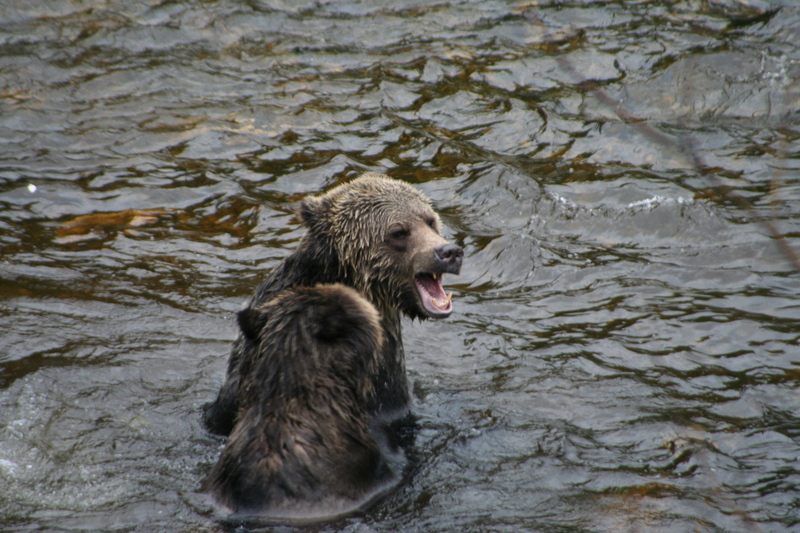 This mother grizzly bear and her two year old cubs are more interested is what is behind the bush in the water than the “grizzly bear watching tourists’ in the stands. They can’t quite see through, over or around the bushes but they know something is there. 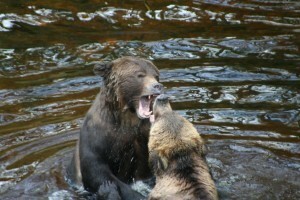 The something is the salmon which they can smell but more likely other bears in the river which they can also smell. 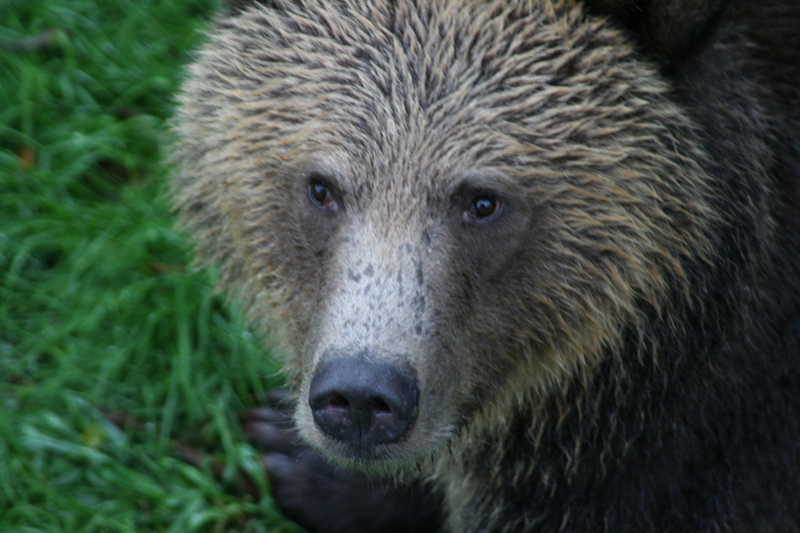 Mother grizzly bears with cubs are always cautious. 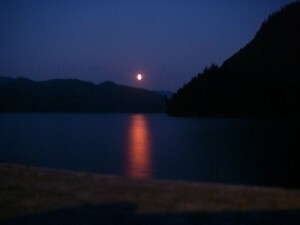 Photographers always find a subject for a picture in this case a moon rises rather than a sunrise. 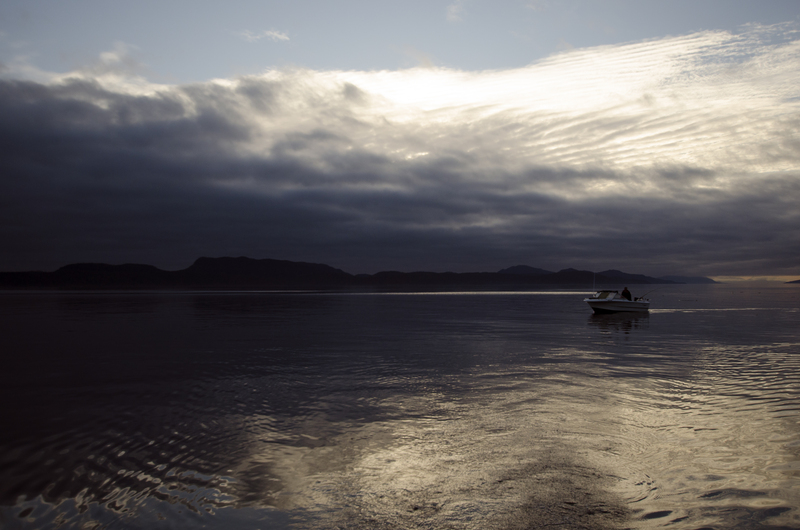 The scenery in this part of Canada’s British Columbia’s coast is often overwhelming for our guests. As a guide I am frequently asked to stop for pictures that I take for granted but I realize that this is all new experience for our guests and memories are captured on film. “Mom I’ve got a secret. 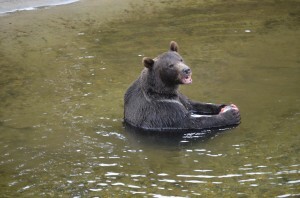 There is somebody over there in a boat watching us.” The spring grizzly bear tours from our lodge on BC’s Knight Inlet are viewing bears on the beach. 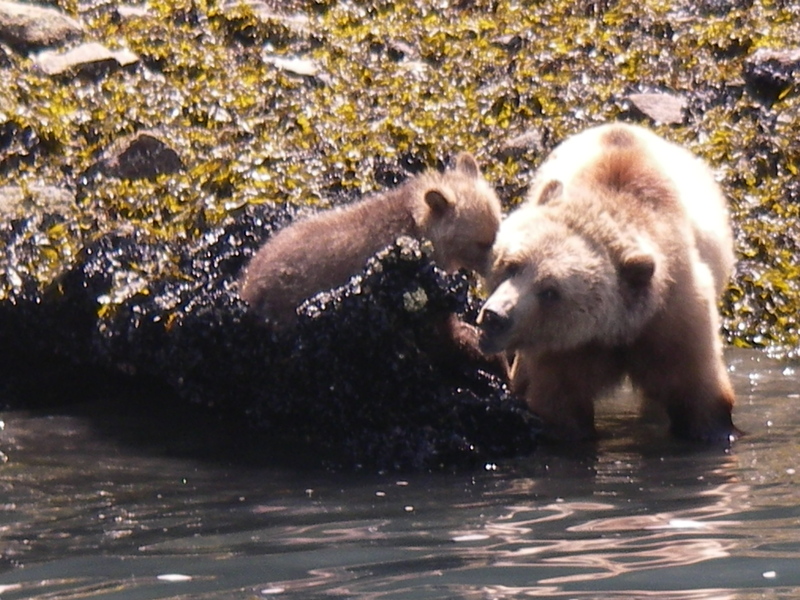 The salmon do not arrive until mid-august so the grizzly mothers and cubs spend their days eating sedge grass or in this case turning rocks on the beach looking for protein. 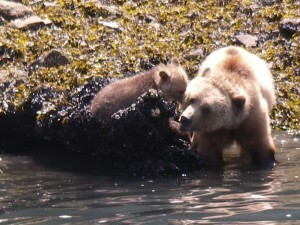 This is the “cub time of the year” born in the winter they are only a few months old and stay close to mom. 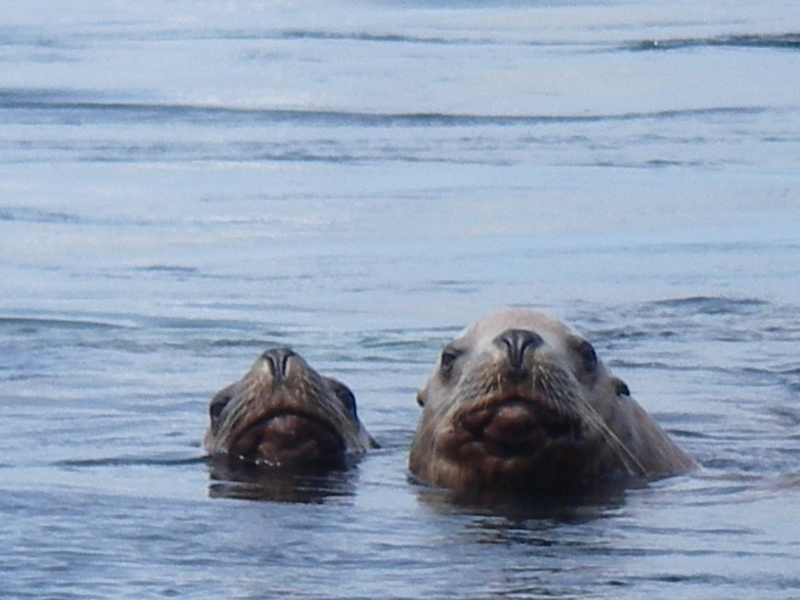 Most days on your whale watching safari we find stellar sealions. Although most pass through this part of BC’s coast on the way to and from Alaska in the spring and fall some do stay all summer. 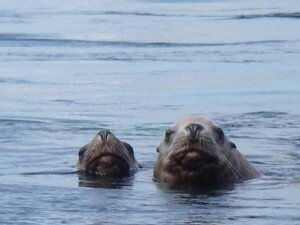 If we eat our picnic lunch in the area around Vancouver Island’s Telegraph Cove the sea lions often come to check us out so their picture is added to the bucket list. 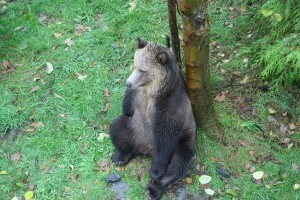 Although most of the time the grizzly bears just ignore us at times the youngers bears do take and interest. In this case it is the grizzly bear doing the watching. You can see the edge of the viewing stand’s concrete footing. Don’t need a much of lens for these shots. 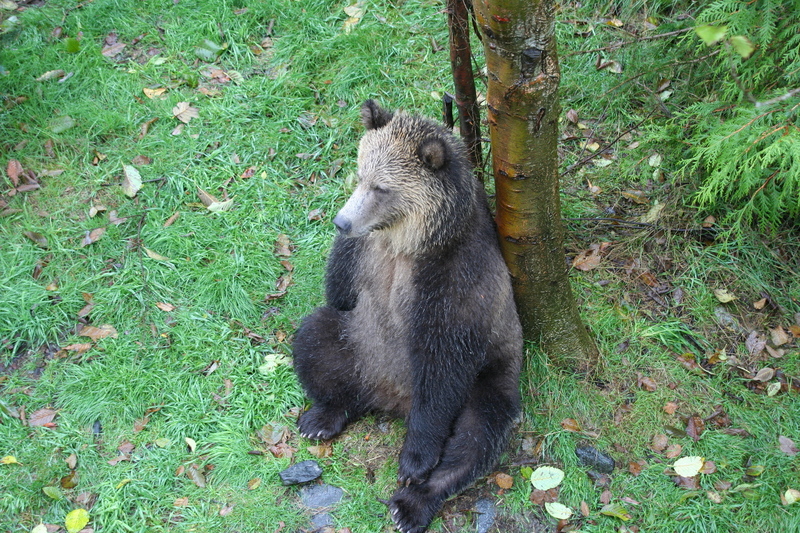 The grizzly bear that remained took time to sit and study the situation of being “watched” but being young it got bored fast or maybe just an “itch” in need of a back rub. 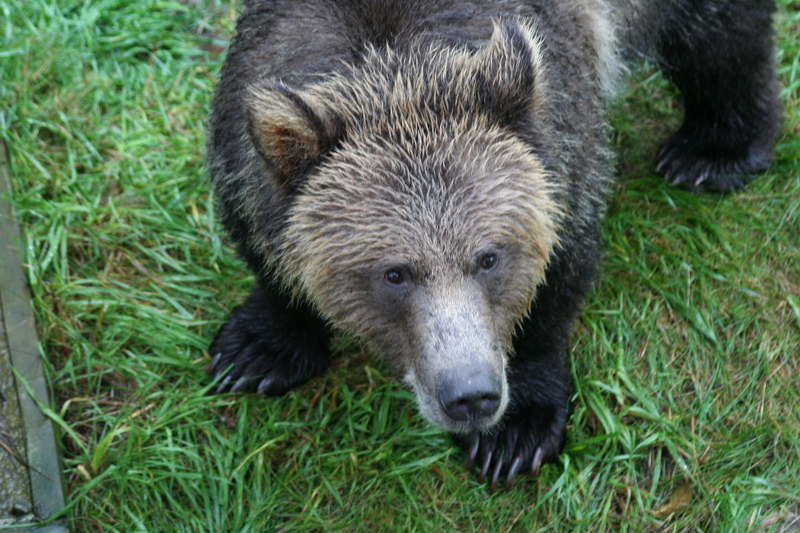 Every tour from the lodge has something different to offer.